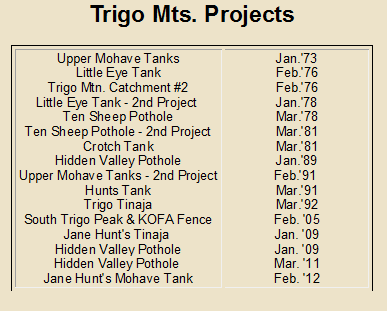 Click on the numbered list below the map for a mountain range, or click one of the date ranges at the bottom of the page to view projects sequentially by year. This page is a work in progress. We are continuing to migrate over the 46 years of photos to the new website. 10 - Castle Dome Mts. 16 - Dome Rock Mts. 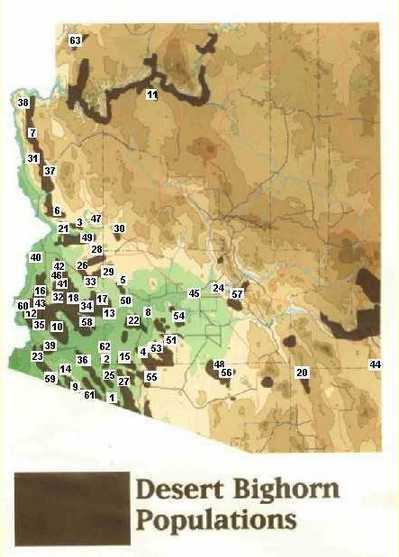 22 - Gila Bend Mts. 38 - Mount Wilson Wldrns. 42 - North Plomosa Mts. 43 - North Trigo Mts. 48 - Ragged Top Mts. 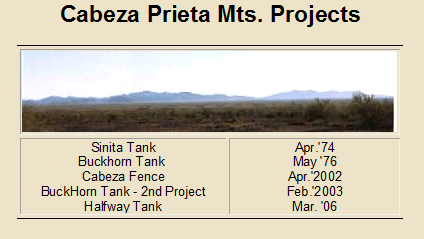 62 - Upper Aguila Mts. Signal Peak Tank Sauceda Mts. Bob Curtis Tinaja – 2nd Project Sierra Estrellas Mts. Olaf and Nax #2 Mohave Mts. Hack's Rim #1 Harquahala Mts. 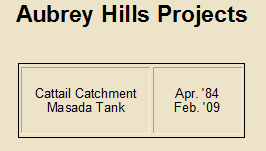 Grama Canyon Catchment Tank Mts. Bush Head Catchment Redevelopment New Water Mts. Wrather Wildlife Catchment Trigo Mts. Golden Door Catchment Sierra Estrellas Mts. Black Tank - 3rd Project Plomosa Mts. 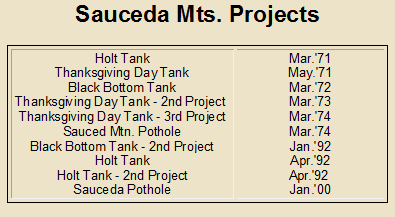 Holt Tank - 2nd Project Sauceda Mts. Coati Catchment Sierra Estrellas Mts. Granite Pass Catchment Bill Williams Mts. Wayne Webber Catchment North Plomosa Mts. Cataract Canyon Catchment #1 Eagletail Mts. Platinum Catchment Granite Wash Mts. Dragon's Tooth Catchment & Tinaja Peloncillo Mts. 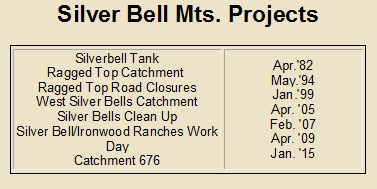 Dean Layman Catchment Silverbell Mts. 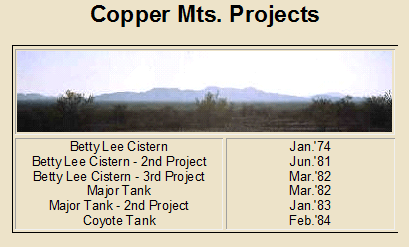 Betty Lee Cistern - 2nd Project Eagletail Mts. Bee Hive Tank Copper Mts. 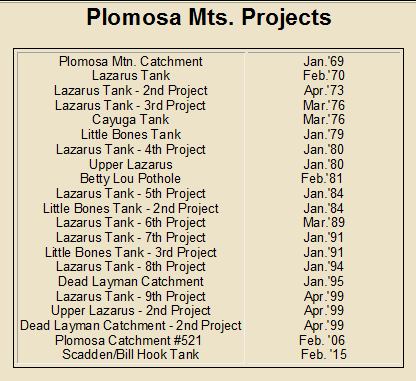 Columbine Springs 2nd Project Plomosa Mts. Lost Cabin Springs Gila Bend Mts. 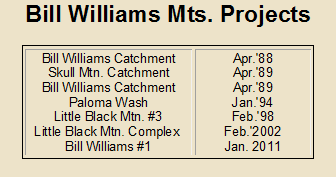 Bill Williams Catchment New Water Mts. Anvil Tank - 2nd Project Trigo Mts. Ragged Top Mtn. Pothole Middle Mts. Ragged Top Mtn. 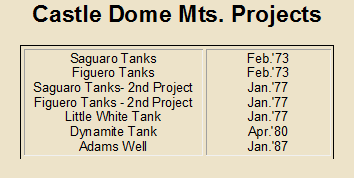 Pothole - 2nd Project Dome Rock Mts. 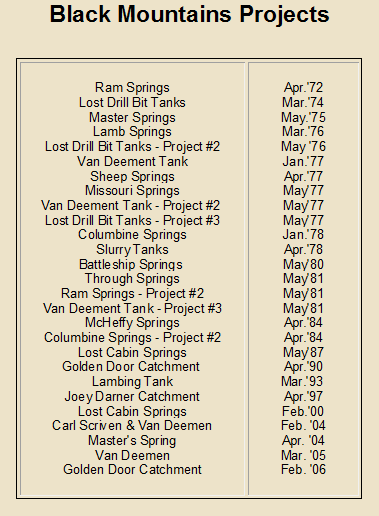 Ram Springs Sand Tank Mts. 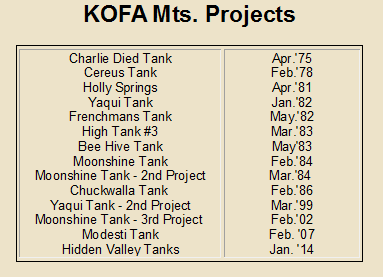 Lazarus Tank - 2nd Project Tank Mts. 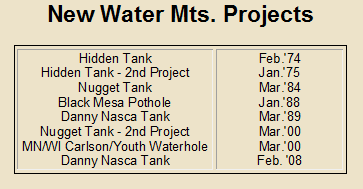 Master Springs New Water Mts. Lost Drill Bit Tank - 2nd Project Tank Mts. 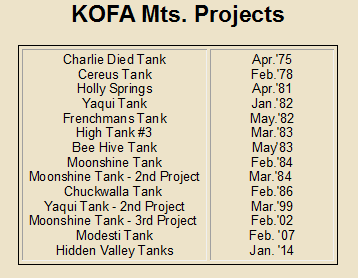 Lost Drill Bit Tank - 3rd Project Black Mts. 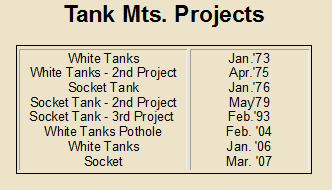 Socket Tank - 2nd Project Dome Rock Mts.